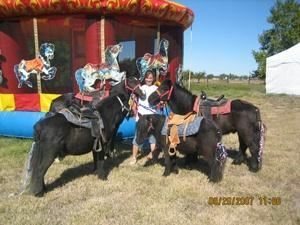 Tickle Me Pony Parties & Travelling Petting Zoo is a family owned business based at Brentwood Ranch, CA. They provide hand guided pony rides, pony parties and small animal petting zoos all over the greater San Francisco Bay Areaand Central Valley, since 1990. Its professionalism and commitment to detail both to customers and animals allows us to provide you with the Best Party in Town. They have fully insured and licensed. They voluntarily comply with USDA Federal requirements and standards for animal health, care and safety. You can hire us for your festival or fair or big event. They growing sons are 5 and 8, full of tremendous energy and always keep us on the move. They love all of the ranch animals, especially their goats and they love all things boys do; taekwon, soccer, tumbling, basketball, snakes and lizards, and their video games.